"Oh, you know, 'The people of Planet Zog are being fought by the Zognauts...' I don't give a toss. I go through Radio Times, reading the billings of Mete shows — 'The crystals of Narthok are in danger from the blah blab blab' — and I don't care. The audience is so much more intelligent than that. I won't have dumbing-down for a second." Travelling down to some studios in Wales, I had been vaguely wondering why the BBC had suddenly decided to remake Doctor Who. I learn the answer as soon as I walk into Unit Q2, Imperial Park, Newport. It is standing in front of me, babbling fluently and, I slowly realise, brilliantly. It is Russell T Davies, chief writer and executive producer, and previously writer of Queer as Folk and some of the best children's television shows. Without this camp, chortling, verbal torrent, this encyclopedia of schlock TV, this genially conceited motor mouth, there would have been no point in vying to resurrect our own space opera. Nobody else could co" viably' have got it right. "I mean. I've watched the Harry Potters several times. I don't say you've got to match them. You disappear up your own arse you try to chase cinema on television, but you've got to nod towards it. You've got to have professionals. These scripts are better than Harry Potter scripts — good characters, good stories, good jokes, good scares." They show me some clips of the new show, with Christopher Eccleston as the Doctor and Billie Piper as his "young assistant". 1 remember when that phrase first acquired inverted commas. I was about 13 at the time. "I never ask what he was doing with his young companion," says Davies, with mock huffiness. "It's the sort of thing journalists think about" The clips make it clear. Davies may babble, but he also delivers. The scripts are, indeed, much better than Harry Potter. They are slick, wiry and, most important of all, fresh. They also have Davies the Mouth's fingerprints all over them. The Doctor's slightly deranged monologue sounds suspiciously like Russell T himself. "So, you identify with the Doctor?" I ask him between clips. "More with Billie," giggles Julie Gardner, producer, head of drama for BBC Wales and pan-time Wise to Davies's Morecambe. He affects a juicy pout. "Oh, yeees." Okay, enough of this. Doctor Who began on November 23, 1963, and ended in 1989. There was a one-off TV movie in 1996. The series was silly, naff, consoling and, especially in its choice of actors to play the Doctor, brilliant. From William Hartnell and Patrick Troughton through to Jon Pertwee and Tom Baker, the doctors were batty, obsessed, dandyish and polychromatically starved. Above all, they were British types. Compare these characters to those in the first series of Star Trek, which began in 1966. With the possible exception of "Bones" McCoy, Kirk and his crew were sensible, post-Kennedy, liberal American heroes, sane and reliable. The Doctors, in contrast, formed a portfolio of honkers Brits. Eccleston might, in this context, be a problem. Bill Nighy had been floated, the obvious choice — if anything, he would have been the battiest of the lot But Eccleston is just a wiry lad in a leather jacket that Davies describes as "strangely timeless". His good, but is he lasting? Will Dead Ringers be impersonating him years hence, as they do Baker? Never mind: the Britishness of the enterprise is intact. "This is very, very British." says Motor Mouth. "We've got the Houses of Parliament and red buses. It's all very emphasised. The fast shot is the earth from outer space, and it zooms into Britain and London. We've had all those yellow school buses and prom days. We've had enough of that." Actually, he hasn't had enough of it all. He is crazy about American teen sci-fi such as Buffy the Vampire Slayer. His favourite film of all time is Back to the Future. In fact, it is exactly this kind of enthusiasm that makes him so aware of the kind of competition the new Doctor Who is up against. For the truth is that, apart from the weird excursion of Blake's 7, which ran from 1978 to 1981, the Doctor was the only real British attempt to do TV sci-fi. We handed over the genre to the Americans and they ran with it, producing gems such as The X Files or Huffy, as well as the various, often gemlike, Star Trek iterations. The problem then become competing, not just aesthetically but also. financially. American television wealth meant those shows could produce special effects good enough to convince the Matrix generation that they were worth watching. This, too, has changed. The cost of special effects has dropped and, meanwhile, we have some of the best effects people in the world. As a result, this series is replete with light and magic, all made by The Mill, the Soho outfit that did, among other things, Gladiator. That movie, however, had a mere 100 visual effects. This new Doctor Who series — 13 45-minute episodes — has about 800, and The Mill has been churning them out at the ram of 100a month. 'T don't know," says The Mill's boss, Robin Shenfield, 'but Pm pretty sure nothing of this scale has ever been attempted — certainly nothing British." This means that the beloved clunkiness of the old series — cardboard sets, crummy aliens —is to be replaced by computer-slick graphics. This is, at the very least, a sentimental loss. Mike Tucker, the miniature-effects supervisor on the new series, also worked on the old one. He used to admire its fanatic overreaching. "It was always pushing against the boundaries of its budget, trying to do stuff it couldn't possibly achieve," he says. "They would try to make the Loch Ness monster attack a village, or they'd have an attack with a horde of Daleks when they had only three Dalek props. It was one of in great charms. But then Star Wars came along and raised the game. These days, kids are so effects-literate." The big issue, of course, is the Daleks. They are back, and they look much the same, except that they now have a harsh bronze sheen and are plainly better built. They still have the sink-plunger weapon, which, on the originals, really was a sink plunger, and they slit appear to be severely restricted in their evil work by their inability to climb stairs. Davies, typically, has turned both these attributes into roguish gags. The sink plunger kills somebody humbly — a sort of lace-sucking operation. I gather — and wheel Piper turns up a staircase to escape a Dalek, she discovers, to her horror, that they can fly. Obvious, really. Wholly new to the series is Cassandra She is what an American waiter would call Davies's "signature dish". Several billion years in the future, she is all that remains of the purely human species, and she has definitely overdone the dieting, having become no more than a stretched film of ski, with a face. Voiced by Zoë Wanamaker, she's like Patsy in Ab Fab: bitchy and randy. "But she turns out to be murderous, and has a fantastic death," says Motor Mouth. One other "signature dish" is the takeover of the bodies of the British cabinet by aliens. This produces unfortunate amounts of gas, so the entire cabinet farts continuously. What is interesting about all this is not just the campery of Davies's imagination. but the sensitivity that makes it all work. He understands that the old formula has to change. Piper, the young assistant, for example, can't just tan around screaming: she has to have a background, and he has given her a family and a boyfriend. "She's got a life— the old companions didn't have a life," he says. Equally, Davies understands that there are fundamental structural and stylistic elements that cannot be changed. The Doctor must be a little crazed, the assistant pro-sides á curious, contemporary perspective, and the Daleks and the police box are just too much part of the brand to be discarded. The wick is to get the right balance of innovation and core values. "It's a good idea, and good ideas never die. I love it when Disney does The Lite Mermaid, and everybody says, 'How dare they change the ending?' But the Disney ending is better than the original. It's like Beauty and the Beast, a germ story that's there to be told again, and they automatically become new stories. It's a bizarre idea that they should just gather dust. Robin Hood. Tartan, Sherlock Holmes — Doctor Who has the stature of those"
This suggests that the shelf life of the Doctor	Who idea is more or less infinite. But it requires intelligent protection. Even the best American sci-fi shows, such as Buffy and The X Files, went into decline too quickly. They, as Davies puts it, "vanished up their own mythologies". Basically, the shows got no involved with their own setup that they became for too self-referential. "You can disappear up your own arse with your own continuity," he says. 'Those shows needed a good clean-out every three years. They get darker, they get wrapped up in their own very good stories." It is at moments such as these that you see the acute and intelligent critic lurking beneath the campery. But is he intelligent enough? Doctor Who is a huge gamble for the BBC. It will probably go out in its old slot, early on Saturday evening. This pitches it into the most competitive and difficult ratings moment of the week. At the moment, drama barely gets a look-in against Ant and Dec and all the other babble. The wick for the Doctor is to fight this with a show that grabs the children as well as their parents —just, in fact, what the old one did. I hope it works. Doctor Who is British sci-fi, full of native wit, charm and a strange son of familiarity, a sense of belonging somewhere. 'The thing about Star Trek," says old Motor Mouth, suddenly wistful, "is that you can't join in. It will never happen. But you can imagine walking home from school, turning a comer and seeing the Tardis. You could just walk in and join the Doctor. It could happen." APA 6th ed. : Appleyard, Bryan (2005-03-06). For 25 years, Doctor Who's creaky charm captivated a nation. The Sunday Times p. Culture, p. 6. MLA 7th ed. : Appleyard, Bryan. 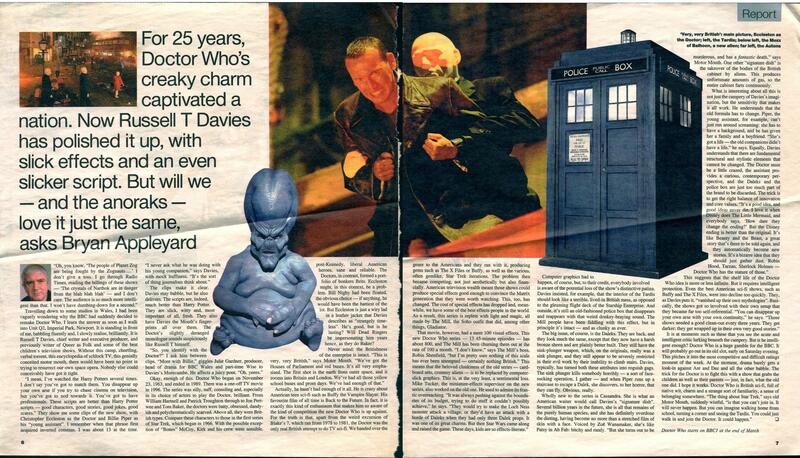 "For 25 years, Doctor Who's creaky charm captivated a nation." The Sunday Times [add city] 2005-03-06, Culture, p. 6. Print. Turabian: Appleyard, Bryan. "For 25 years, Doctor Who's creaky charm captivated a nation." The Sunday Times, 2005-03-06, section, Culture, p. 6 edition. This page was last modified on 11 February 2016, at 02:04.